World Class training materials are available to you. Join award winning clients like Verizon, Pfizer and Walgreens and license Rath & Strong's intellectual property. For customers who are interested in internalizing their materials, Rath & Strong provides an easy option to purchase a license to use our intellectual property. 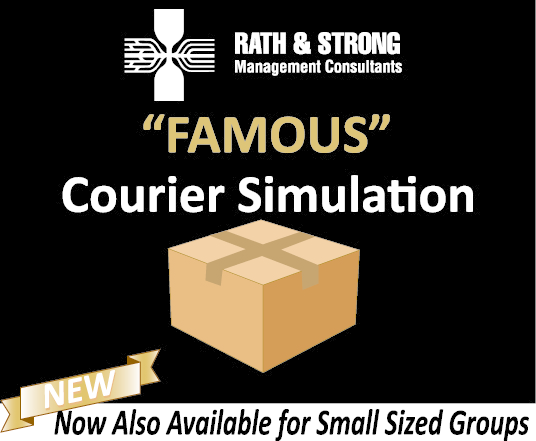 The ability to use Rath & Strong's world class materials will enable you to leverage Rath & Strong's training materials – including course agendas, slides, roadmaps, exercises, data sets, tool templates and instructor notes, as well as workshops like our famous Courier Simulation. Not only do you not need to reinvent the wheel by leveraging Rath & Strong's decades of experience and knowledge but there is no need to waste time and money trying to create training materials from scratch. So, licensing allows you to focus your resources on more critical matters in a faster, cheaper and better way which will ultimately drive a greater value to your organization. A wide variety of intellectual property is available for licensing covering many different methodologies and topics. Rath & Strong also offers customization, translation and Train-the-Trainer services for such intellectual property, which allows you to leverage the value of the intellectual property to even a greater degree. For more information about licensing please complete our inquiry form or call us at 781-861-1700. © Rath & Strong Management Consultants LLC, Rath & Strong, Ltd. All rights reserved.